We play a game every day. We meaning hubs and I do. The game goes like this, “What do you want for dinner”, one of us says, “I don’t know what do you want”. Hubs says, “I’ll make pork chops”. I say, “It’s too cold for grilling, it’s 10 degrees out.” Hubs makes chops one way and one way only, on the Grill. He says, “It’s okay, it doesn’t bother me if it’s cold outside.” ( Hubs has been known to grill in sub zero weather). So I decided to make Crock Pot Pork Chops and not have any freezing bodies lying around. This recipe is so easy, you are just going to love it! 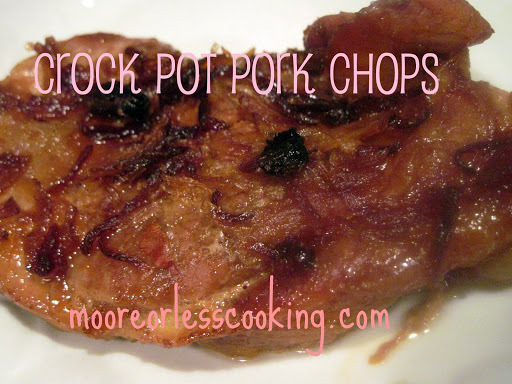 Place Pork Chops in Crock Pot, mix all of the ingredients and place over pork chops. Cook on Low setting for 6 hours, or high setting for 4 hours until internal temperature of pork has reached 145 degrees F (63 degrees C). This recipe has been adapted from ALLRECIPES.Com and made even better by Me! This post has been linked up to these fabulous blogs! 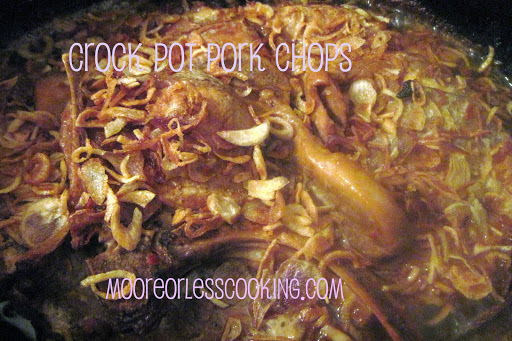 Filed Under: Crock Pot Pork Chops, Dinner, Meaty Mains, Pork, Pork Chops, Slow Cooker. Nettie,What a lovely bbq-ey indoor pork chop and in the crockpot, no less. Nicely done! Thanks Nettie! I will try to copy and paste. Looking forward to more of your delicious reciples. Worked like a charm! 🙂 Thanks again for your help. These chops look and sound very tasty Nettie! Can’t wait to try. With the heat in Florida, I use my crockpot more in the summer so I don’t heat up my house. Yum!